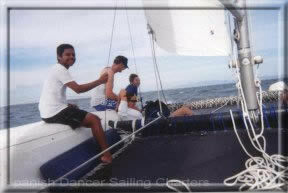 Catamaran Sailing Charters and Snorkel Adventures! Built for speed and comfort ! Come aboard the Spanish Dancer and feel the wind in your hair as you see the many dolphins, whales, sea turtles, and birds of the Manuel Antonio Marine Preserve. If you want to just relax on our comfortable trampoline deck, our crew will be on hand to serve you a feast of fresh fruits, tuna, pasta, salad, drinks and the finest hospitality in Costa Rica! Our 36' racing catamaran is fully equipped with safety equipment (US Coast Guard Standards) swim platform, cellular phone, 2 VHF radios, toilet, on board music, snorkel equipment, well stocked bar and has ample room to relax or tan as we sail the Pacific coast. 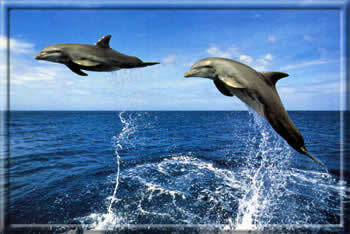 Dolphins play in the wake as we sail silently through the blue pacific waters. The rushing of wind and waves are frequently interrupted by the splash of dolphins and whales coming near for a closer look. Your hosts, Sherry, Joe, Mike and the crew.... will see that you and your party enjoy yourselves while experiencing one of the most wonderful sailing cruises ever. 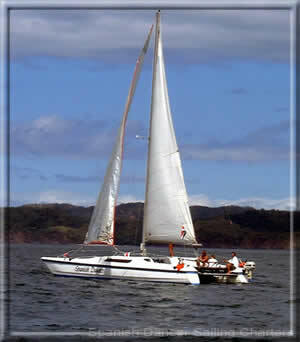 They offer your choice of a morning sail into the Manuel Antonio Marine Preserve or a sunset sail. The package includes snokling equipment, a tour of the offshore islands and a delicious meal. Relax and lie down on our comfortable trampoline deck as we search for pods of dolphins, seabirds, whales and turtles. We offer an open bar throughout the trip and gourmet lunches are served onboard once we reach our destination, a quiet beach. Snorkel, tan and explore caves or just relax on board. It isn't unusual to see whale sharks, humpback whales, manta rays or sailfish jumping, so keep your eyes on the water. Honeymoons, weddings, birthdays or any special occasion! 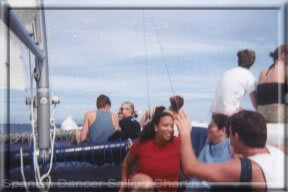 Multiple beaches, sunset cruise or special catering is easily arranged. For advance bookings please email us and we will be start planning your private adventure..